Abstract: By default the OCZ PC3500 EL Gold Edition GX DDR memory is rated to run at up to 216 MHz (or DDR433). When it comes to computers based on AMD Athlon64 processors, the topic of whether it's better to equip the system with low latency or high bandwidth (high speed) DDR memory is still being hotly debated. I've been a low latency buff myself for quite a long time, and currently of the mind set that the bandwidth option only comes into play at very high memory speeds.... This means that for those of you who like to run your computers overclocked moderately, you'd probably be better off with lower latency memory modules. By the looks of OCZ's PC3500 EL Gold Edition GX memory, and more specifically each 512MB module's CAS 2-2-2-5 timings, we're right on the money with that assessment. By default the OCZ PC3500 EL Gold Edition GX DDR memory is rated to run at up to 216 MHz (or DDR433). A memory capacity of 1GB seems like the sweet spot for everyday computing, and the two 512MB OCZ PC3500 EL Gold Edition GX DIMMs are also "optimized" for dual channel configuration. 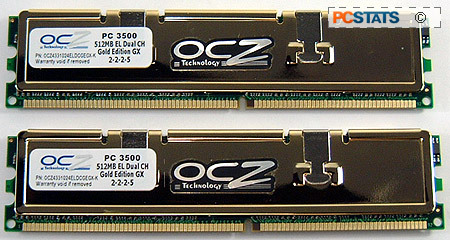 The OCZ PC3500 DDR comes wrapped in gold plated copper heatspreaders which give each module some heft, and help to insulate the DRAM from physical damage. OCZ also present consumers with a warranty on this memory. If there are technical problems when installing the memory, consumers can make use of the OCZ toll free 1-800 number for tech support. Having problems with a set of memory can be frustrating enough if it happens, long distance charges on top of that only add to the frustration. Giving the support number a ring, we were greeted by an actual person (imagine that! ), after two previous attempts within about 5 minutes of each other had led to a busy signal. Overclocking the OCZ PC3500 EL DDR! As usual before we begin overclocking, I first lowered the CPU clock multiplier to 6x, this way the processor will not hold the memory back in terms of overclocking. Starting at 200 MHz and keeping 2-2-2-5 memory timings, I started to increase the motherboard clock speed slowly in ~5 MHz intervals. Things began roughly for the PC3500 EL Gold Edition GX DDR memory, and at 217 MHz the memory needed its voltage increased to 2.8V to run stably. After that was done, the memory played quite nicely and I did not hit another snag until the 233 MHz mark. At that speed the memory began to give us weird errors and cause the system to crash back to desktop while running 3D tests. Increasing the voltage slightly once more, this time to 3V, solved that issue. A voltage of 3V is high, but the DFI motherboard is good up to 4V for memory! Just be careful of what you are doing as high voltages can damage memory - if you are unsure do not go past 2.8V. At 242 MHz the system started to show some signs of instability again, and this time we increased the voltage to 3.2V. With that much voltage we were able to run the OCZ EL PC3500 Gold GX DDR memory at a very nice 250 MHz with 2-2-2-5 timings. The memory would not go above 250 MHz unfortunately and more voltage did not help calm things down. Still 250 MHz while keeping 2-2-2-5 timings is a nice accomplishment. I was also interested in seeing how well the memory would overclock with lax timings.... but it didn't go all that far. With 3-4-4-8 timings, the maximum speed we were able to overclock the OCZ memory to was 257 MHz. In this case, the memory voltage did not play a key role. It was stable at this speed with 3V, increasing the voltage just lowered the maximum overclockable speed. Now, on with the benchmarks!